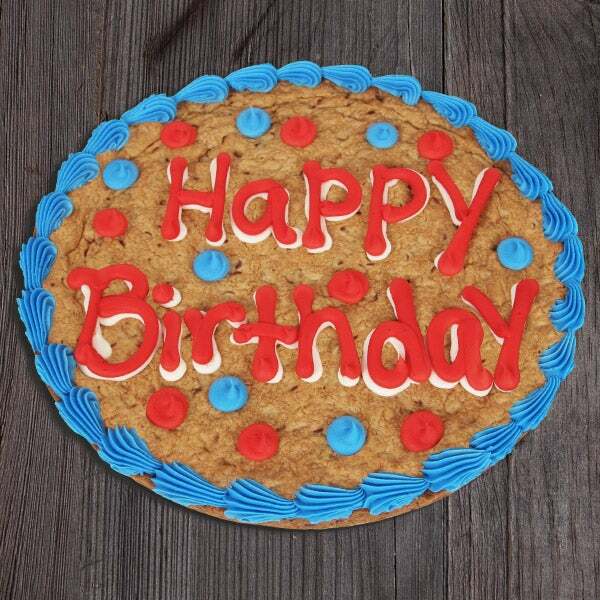 Happy Birthday Cookie Cake is rated 4.9 out of 5 by 69. Rated 5 out of 5 by J0 jo from Awesome! I bought The Birthday Cookie Cake for a friend of mine who has three little kids. I don't know who was more excited..my friend or the kids LOL I got a call with a thank you and the kids were screaming in the background "Thank you,,We love You!" Rated 5 out of 5 by Liana from Delicious cake! This is the third time I buy this cake and is always a hit! My son and his friends loved it every time he gets one! Rated 4 out of 5 by gmail from Great Way to say Happy Birthday! I sent this to my Sister in law and Brother in Law for their January 16 and January 24th birthday. I normally send an annual Mrs. Field's cookie cake but was never fully satisfied with the customer service and shipping costs to expedite. The Free Shipping option definitely sold me and they LOVED it more than the other cookie cake. Thank you for making Birthday celebrations must sweeter! Rated 5 out of 5 by dallas2809 from Great cookie Cookie showed up right on time. Brother loved it! Rated 5 out of 5 by Arwb from A hit! I bought 3 Halloween cookie cakes for my 6 grandchildren. The 3 households loved them! I will definitely use again. Rated 5 out of 5 by Liana from Perfect for Halloween! I bought this for my son who is in college and I wanted to give him a surprise... He absolutely loved it and his friends too! Rated 5 out of 5 by JosieB from Made somebody’s Day!!! The happy birthday cookie was a big hit, thank you!!!! More unique than the usual cake, this 12-inch birthday cookie is sure to delight! It's loaded with a generous amount rich chocolate chips and hand decorated with creamy vanilla frosting, making it the sweetest way to wish your recipient many more!